The Desert Tech Scope Mount was engineered to create a functional, reliable, and durable bridge to your optic. 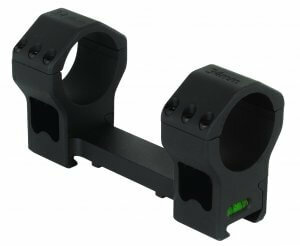 It can be used to mount both 34MM and 30MM scopes, and is available in zero, 20, 30, 40 MOA cants. The various cants are applicable to different shooting practices, as a general rule if you are shooting inside 1000 yards, then the zero or 20MOA mount will work just fine. If you are shooting beyond 1000 yards, then the 30 or 40 MOA mount would be better suited. Obviously there are other factors that greatly influence these things such as which scope you are using, and what caliber you intend to shoot. Follow the scope manufacturer’s directions when mounting your optic in the mount, ensure that the scope is mounted level, and ensure all screws are tightened evenly and torqued properly.